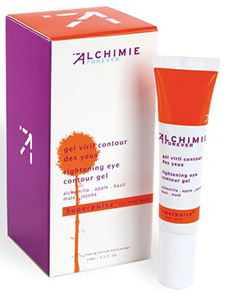 This oil-free, tightening eye contour gel penetrates instantly to reduce puffiness. Apple extract helps minimize the look of fatigue while protecting from the effects of environmental stress. Alchemilla, a powerful astringent, minimizes under-eye bags, while jojoba increases firmness and elasticity. Antioxidants derived from maté and the vitamin K contained in basil combine to reduce the appearance of fine lines and dark circles. Clinically proven to be highly concentrated in antioxidants. Suitable for all skin types. Apply morning and evening to eye contour area; for external use only.